Google isn't the only company that's recently been working on reinventing the inbox, and the latest contender is IBM Verse. 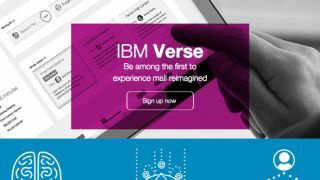 IBM Verse is a business-focused email client that the company says "fuses cloud, social, analytics and design innovation to transform the way we work." Much like Google Inbox, Verse organizes and priorities users' emails automatically, but with a focus on enterprise. IBM calls Verse a "freemium social collaboration offering" and says it integrates elements of email, meetings, calendars, file sharing, messaging, social networks, video calls, blogging, and more in a unified environment. Verse reportedly learns employees' habits over time and eventually determines what information it needs to prioritize on a day-to-day basis. IBM says it created Verse with design in mind, and its interface is optimized for mobile and web, with iOS and Android apps integral to the experience. It will eventually even have Watson support, letting companies embed their own Watson computers so their employees can query them directly. IBM Verse will be available this month in beta for "select enterprise clients and partners," while a freemium version will roll out more widely on IBM's Cloud Marketplace in early 2015.